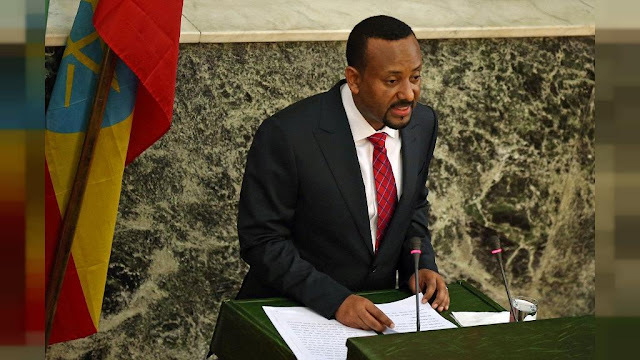 Ethiopia’s parliament swore in Abiy Ahmed as prime minister on Monday with a mandate to implement democratic reforms aimed partly at defusing ethnic tensions in the Oromiya province from which the former army lieutenant general hails. The ruling coalition picked Abiy last week to replace Hailemariam Desalegn who quit to clear the way for reforms. “Today is a historic day. We bear witness to a peaceful transfer of power. Today our situation presents us with opportunities and threats. Today we are in the midst of uncertain times,” Abiye said in a speech to parliament. Dr. Abiy Ahmed says the government should respect the rule of law, but it is also its responsibility to maintain the rule of law. He expressed his readiness to negotiate with the Eritrean government, to solve the differences between the two states as part of his plan to stabilize the horn of Africa region. Abiy promised to crackdown on rampant corruption in Ethiopia. Says his government will prioritise improving the quality of education by adopting sound policies. Pledged to create job opportunities for the youth, create more young entrepreneurs and business owners. Called on exiled Ethiopians to return home. Apologised to civilian victims of the state crackdown and security forces killed in the recent protests. Extended an olive branch to opposition parties, saying they will henceforth be viewed as ‘competitors not opponents’. The prime minister also paid a moving tribute to his mother and wife, a gesture local media said is rare for Ethiopian politicians. The ruling Ethiopian People’s Revolutionary Democratic Front (EPRDF) has been in power since 1991, when it took over from the Derg military regime. But the protests and unrest in Oromiya have posed the biggest ever threat to its continued rule. Oromiya, which surrounds the capital Addis Ababa, has been rocked by violence since 2015. This is fuelled largely by a sense among young members of the Oromo ethnic group, which makes up roughly a third of Ethiopia’s 100 million population, that they are politically and economically marginalised. Abiy’s Oromo heritage appears to be a calculated attempt to soothe tensions in his home region. Human rights groups say that security forces have killed hundreds of people in violence. Tens of thousands were also jailed. But in the run-up to Haliemariam’s resignation last month, more than 6,000 prisoners had been freed as the government struggled to calm discontent. It is unclear how many remain in jail. Ethiopia, which is Africa’s second most populous nation and also has had the continent’s fastest growing economy over the past decade, has been under a state of emergency since Feb. 16, the day after Hailemariam resigned.